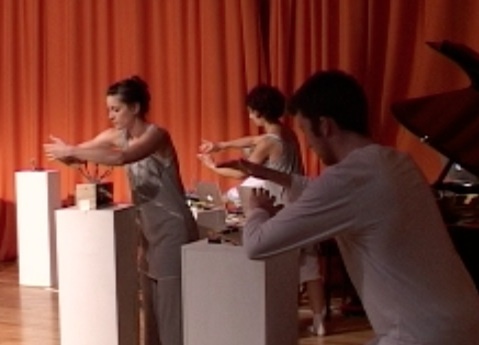 Triggered showcases the results of a practice-as-research project into methods of interdisciplinary collaboration between a group of contemporary dancers, musicians and music technologists. The nature of this collaboration has allowed performance to emerge from artists and disciplinesinteracting and responding to each other. The bespoke technologies used inthe proj~ct enable sophisticated dialogue between movement and sound, between music composition and choreography. The nature of interaction and narratives created are key areas of investigation and these areas will explored in a workshop on the second day of the conference. 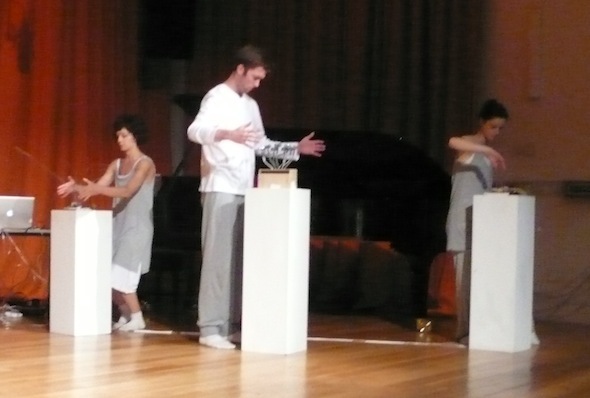 Performing, choreographing, composing and building the production are composers Cheryl Frances-Hoad, Tom Hall, Richard Hoadley, choreographer Jane Turner with dancers David Ogle and Ann Pidcock. Sketches on the Touching of Sound from Richard Hoadley on Vimeo.